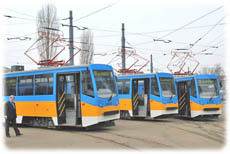 The tram and trolley transport in the capital is carried out by Sofia Public Electrical Transport Company JSC. The company is a municipal sole owner joint-stock company managed by Evgenii Ganchev, Eng. and Executive Director. The idea of using electrical power for transport means occurred as far back as 1834. The electric transport is economical, suitable for the urban environment and in compliance with the environmental protection requirements. In 2008 Sofia Public Electrical Transport Company JSC, as a main transport operator of the capital, has transported over 198 million passengers. 04/01/2009 - 178 trams and 103 trolleys run on 16 tram tracks and 9 trolley tracks on a daily basis. According to the report for 2008, 17 725 540 kilometers were travelled between the different districts of the capital. The power supply for the electric transport in the city of Sofia is provided by 24 rectifier stations with a total installed capacity over 125950 kW with more than 73 rectifying aggregates, and over 440 terminal fields. The network consists of over 263 km tram tracks and 257 km trolley tracks, and the cable network is more than 740 kilometers.